Former Australia star Scott Fardy has been a revelation at Leinster this season, securing a European Player of the Year nomination as the province booked a place in the Champions Cup quarter-finals. The former Brumbies forward featured in the World Cup final with the Wallabies in 2015, before deciding to move to the northern hemisphere at the end of the 2017 Super Rugby season. 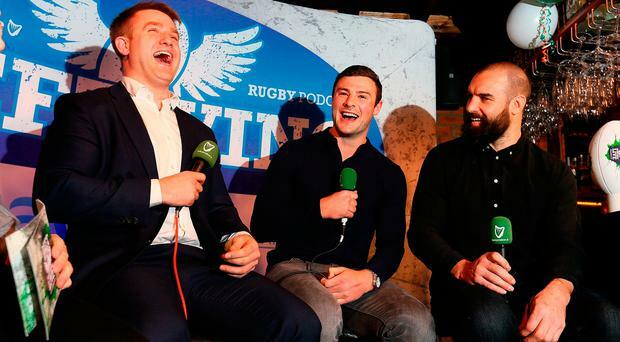 Since making his Leinster debut, Fardy has been one of the team's most consistent performers, and speaking at a special live episode of The Left Wing podcast at Kennedy's Pub on Westland Row in association with Laya Healthcare, he explained why he decided to move to Dublin. "It was on an opportunity to play in big games in Europe," Fardy said. "I wanted to come over here, I think the European rugby competition is fantastic. It is such a unique competition, it is such high pressure and high stakes. To be part of that, and I knew Leinster had been one of the better teams over the last decade and had a squad capable of winning it. So to come and be part of that, it has been great so far." Fardy was also asked about the differences between playing Super Rugby and in the Champions Cup, and revealed a nickname he has for Leinster head coach Leo Cullen in his answer. "It is different, I call Leo Cullen 'The Weatherman' because he is always talking about the weather," Fardy said. "He is always like 'the wind is going to be coming from the west today' or 'we might get 10ml of rain heading into the game'. So I think the weather plays a huge part. You see that with the way teams play and the way Glasgow play with their new [all-weather] pitch. With the old pitch it was a mudbath."